Distribution - Golden Coast. National distribution to the wet leisure industry. Golden Coast look to build relationships with our customers that add value and support the growth of their business. As the country’s largest independent distributor to the wet leisure industry, our distribution network obviously plays a key part in that. We have 30,000sq feet of purpose built offices and warehousing that carries about £1.3million of stock. That’s more than 6,000 live-stock items. 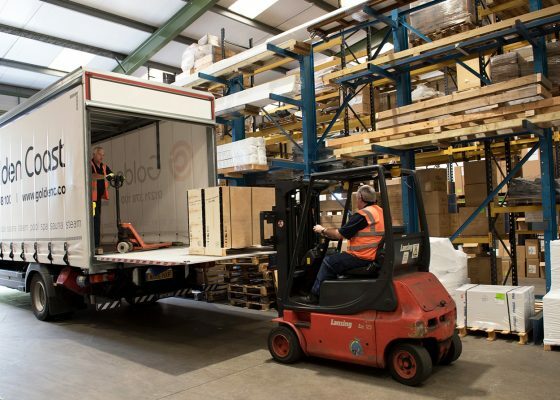 From those warehouses our own fleet of specialist delivery vehicles and drivers do weekly runs to every regional area. All our drivers are experienced in handling awkward, fragile and heavy loads as well as being qualified to transport dangerous goods (ADR). In many instances we can ship to site rather than the account address although this is obviously dependent on access amongst other factors. Having phoned you at least once every day for the last two weeks, and changed the specification more than a few times, I’m impressed and grateful that you’ve managed to keep your sense of humour, and that nothing I’ve ask for has been too much trouble.